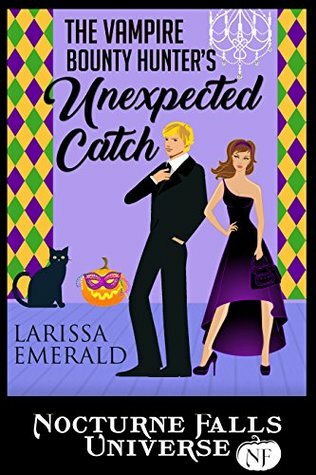 I’ve never read any of Larissa Esmerald’s books, so I was anxious to read what she wrote for the Nocturne Falls Universe. The title alone had me intrigued and ready to read. The Vampire Bounty Hunter’s Unexpected Catch was a quick read, but it left me wanting more after I finished it. Don’t get me wrong, it was an enjoyable read. It just ended too quickly and made me realize there were too many loose ends in the book that were left out. At least I felt there was loose ends. I wanted to find out more about Nathaniel and Camille together. Nathaniel is the Vampire Bounty Hunter in the story and he’s in Nocturne Falls to catch a rogue vampire. He runs across a feline shifter (who happens to be a dance teacher living in Nocturne Falls). Camille is not fond of vampires. (You’ll have to read the story to find out why) The whole entire time I was reading I was ready for some romance between the characters. They had some moments of great dancing together, but nothing that really had them romancing each other. It was not really an insta-love between the two, so that was got me anxious to find out where they were going to go. Unfortunately, the book ended so quickly, I was left wanting more between the characters. The ending also came quickly with why Nathaniel was in Nocturne in the first place. I enjoyed the storyline of the book, but I definitely was not ready for how it ended. I guess I’ll have to definitely check out the continuation of the story and also check out other books Larissa has written. I give this book 3 stars and recommend it to readers of PNR out there. I’ll have to revisit reading this book, once the continuation of the story comes out in Larissa’s other book. Maybe then Nathaniel and Camille will grow on me more.